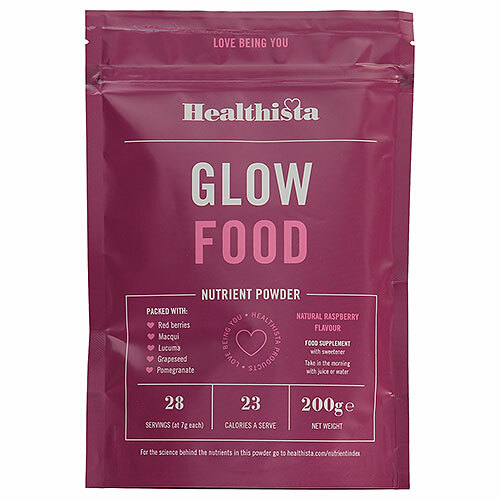 Healthista Glow Food has been formulated to deliver a range of nutrients from fruits and berries including red berries which are rich in anthocyanadins. Beauty is more than just skin deep – it’s about what you put in that can deliver that healthy glow. Regular exercise you love, a diet rich in plants and whole foods are essential along with skin loving nutrients such as vitamin C and omega 3 fats. 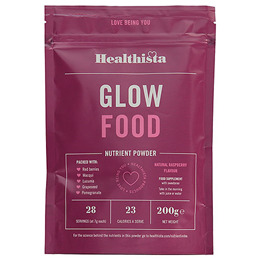 Healthista’s nutritional director Rick Hay has formulated Glow Food to be packed with potent, natural ingredients rich in antioxidants to help fight ageing and proven to encourage formation of the skin’s own collagen, boosting its thickness. Flax seed powder; Montmorency cherry ( Prunus cerasus) powder; cranberry (Vaccinium macrocarpum extract powder, maltodextrin); Lucuma (Pouteria lucuma) powder; Goji berry (Lycium barbarum) powder; bitter orange (Citrus aurantium) powder; Macqui (Aristotelia chilensis) powder; flavouring: natural raspberry (maltodextrin, sweetener: Stevia, gum arabic, natural flavouring substances); pomegranate (Punica granatum) powder; raspberry fruit (Rubus idaeus) powder; Acai (Euterpe oleracea powder, maltodextrin); baobab (Baobab adansonia) powder; blueberry (Vaccinium myrtilis juice powder, maltodextrin); papaya (Carica papaya fruit powder, maltodextrin); guava (Psidium guajava fruit powder, maltodextrin); strawberry (Fragaria ananassa) fruit powder; grape seed (Vitis vinifera) standardised extract; bilberry (Vaccinium myrtilis) powder; purple carrot (Daucus carota) juice powder; olive (Olea europaea standardized fruit powder, anticaking agent:silicon dioxide, carrier: maltodextrin). Take one scoop (7g) or one heaped teaspoon in water, juice or a smoothie in the morning. Or add to porridge, energy bars or cereal for added nutrients. Below are reviews of Healthista Glow Food Nutrient Powder - 200g by bodykind customers. If you have tried this product we'd love to hear what you think so please leave a review.